Ballymena United U19s who have had protein drinks sponsored by Dale Farm. Seen here before Saturday's game with team coaches Paul Quigley, Clifford Adams and John Clarke. Ballymena United under-19s continued their recent improved form with an impressive 4-1 win over Dungannon at the weekend. The Sky Blues started the game at a good tempo and took the lead when a curled pass by Nixon allowed Robbie Perkins to lob the keeper as he was bearing down on goal on the 21st minute. Against the run of play, Dungannon levelled on 33 minutes but Nixon once again turned provider when his cross fell to Paul Rodgers who volleyed first time giving the Dungannon keeper no chance on the 42nd minute. Ballymena continued where they left off and continued to play nice combination passing and on the 67th minute Nixon finally got his chance to get on the score sheet after good work by Dobbin. 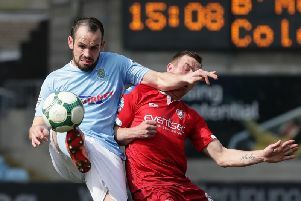 Super sub Danny Black came onto to replace the injured Perkins and on the 75th minute he scored at the first time of asking after a pinpoint cross by Ciarán Dobbin. The Ballymena boys are now reaping the benefits of their styrength and conditioning coaching, on top of their regular training, and they have been boosted by a sponsorship package from Dale Farm. “One of the most important things is rest and recovery and making sure you are putting the correct stuff into your body to give you the most benefits from your training regime,” explains youth team manager Clifford Adams. “The boys are always encouraged to take protein of some kind after training as it helps with the development of muscle growth and the repair of muscles after training and games. “We are always trying to educate the lads to the best of our ability and when our training regime and ethos was presented to Dale Farm they wanted to come on board as part of the lads’ continual development as players and that journey of moving from boy to man when the body develops at an alarming rate. “Dale Farm are now the official protein milk supplier to our training programme and the club are delighted to have them on board as already there is quite a number of players who were taking it. This partnership is massive as it means all the players have the right recovery process week after week and we can’t thank Dale Farm enough for this opportunity,” added Clifford.